Trellises are a pretty part of a lot of gardens. They come in bunches of different sizes and shapes and heights, some simple, some very ornate and with birds or flowers wrought in them. They provide the framework for plants that vine their way upwards, the bones for a growing green thing. Then the story grows. It might be same type of seed as planted by other people, but the plant is unique. It was twists where no other plant twists, it blooms with flowers that belong only to it, it forms patterns and takes paths that no other story takes in exactly the same way. Most books and classes on craft are basically explaining the different types of trellises you can give your story to grown on, and how the trellis will affect the story. That's why it's useful to study craft. Sometimes just a standard trellis is enough for your story, because the story winds itself thoroughly into interesting patterns around a plain structure. On the other hand, sometimes you want a trellis with bird on it in a field of curliques, because the plot will braid more interestingly on a more intricate structure. 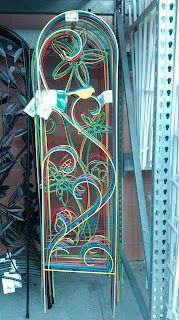 Also, trellises are pretty, and one day I want to have several in my garden. 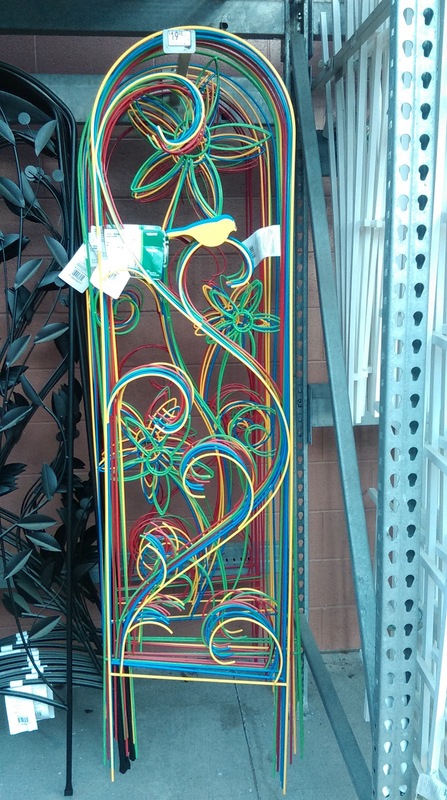 And maybe I just wanted an excuse to take a picture of some colorful and interesting ones, and a blog about trellises seemed like as good an excuse as any.